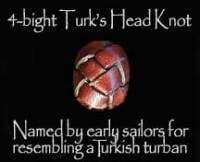 Follow the path of the Turk's Head Knot and you can travel back in time. 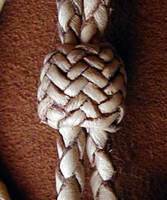 Long before GPS, the Turk's Head Knot was used by ancient sailors to mark their ships wheel. 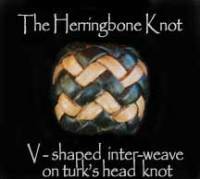 Useful for cinching up tight and staying put the Turk's head knot circled the globe and integrated into many different cultures. 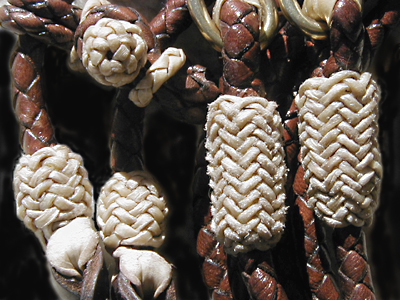 Centuries of knot and braid patterns have been passed down thru generations. 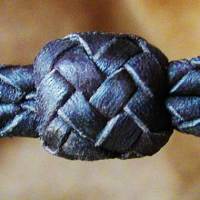 Ancient sailors, craftsmen and cowboy's have all made their mark in the braids and knots that are still being used today. Most of the patterns are so old that their true origin has been lost - yet are known around the world and have many different names. 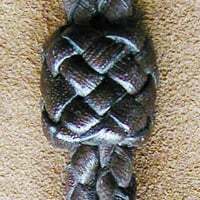 The Turk or basketweave/cowboy knot named for resembling a Turkish turban. 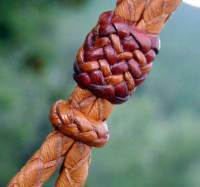 Can also be called a Woggle Knot for the Scouts... and Love Knot for the romantic. Measured in bites and parts and woven in many variations from miniature to the intricate. With no end or beginning looping back on itself. 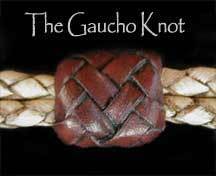 The Gaucho Knot named for the Argentine Gaucho, South American cowboy. The Gaucho, an extra-ordinary artist of rawhide and leather braiding - "trenzador" (braider) gives us the gift of the Gaucho Knot. 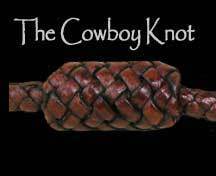 The Gaucho Knot weaves in parallel the Turk;s Head Knot makes sturdy and compact knot. 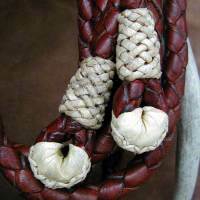 Leather and Braid: The Gaucho Knot - versatile as a slide knot for stampede strings, bolos, bracelets and custom work. The Crocodile Ridge is a beautiful 6 to 10 strand contoured braid has a raised braided middle. In Argentina this braid is called *lomo de yacare. 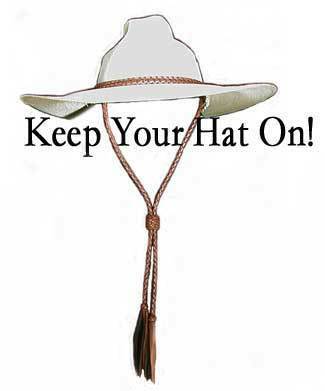 It is also very popular in Australia. 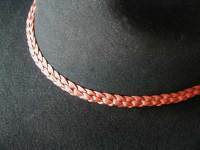 c Related braid the Herringbone Ridge has the ridge contour with the classic V herringbone on the reverse. 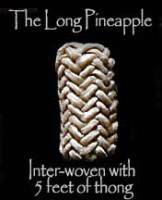 The Herringbone Interweave Knot or "Pineapple" is one of the most used and beautiful fancy knots. 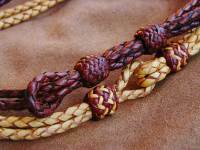 Has a long history in the traditional art of rawhide and leather braiding. 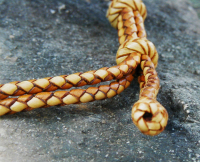 Leather and Braid: Slide knot for stampede strings, bolos, bracelets and custom work. 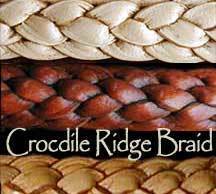 The Crocodile Ridge is a beautiful 6 to 10 strand contoured braid has a raised braided middle. 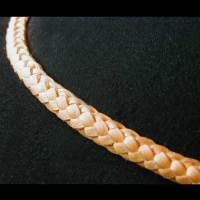 In Argentina this braid is called *lomo de yacare. 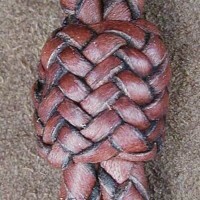 Gaucho interweave on a 4 bight Turk's head. 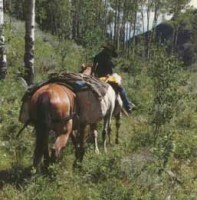 It's name comes from the Gauchos of South America. 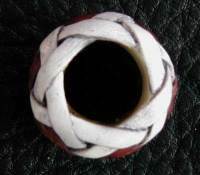 Herringbone interweave on a 6 bight Turk's head. 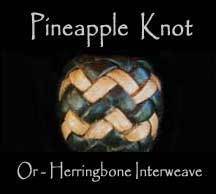 Also called a pineapple knot. All of the interwoven fancy knots with interweaves are made using a Turk's head knot as the foundation. The end always comes back to the beginning. 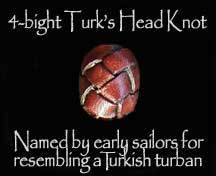 Named for resembling a Turkish turban. 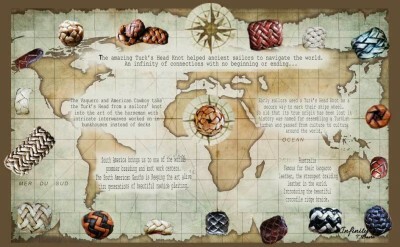 Sailors used the Turk's head knot to mark their ships wheel for navigation And it really did circle the globe! 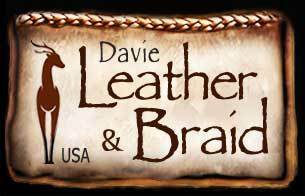 Interested in more Leather braiding? Knot Crazy?